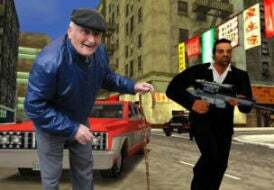 So, Brian's 70-year-old dad took on GTA IV and took quite a liking to it. Others his age are not as enlightened or - shocker - willing to try new things, and so the series might require further explication. Helpfully, here is a FAQ (a FAQ? an F-A-Q? how do I do this) from 23/6 to break down the choices and consequences and action and intrigue that make all the young folk shine shoes and save up their penny-candy money to buy it. So this video game. Is it like pong? No. It's called a "sandbox" game. A sandbox game. That means it's not strictly linear and the player has some freedom of movement within the game. Is this e-mail you're talking about? I think Sen. Ted Stevens was a consultant on this outreach initiative.